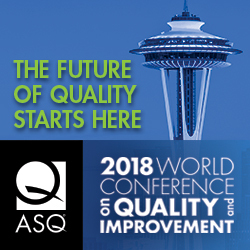 I recently had the privilege of joining the annual ASQ World Conference on Quality and Improvement held in Seattle, Washington. It is the world’s largest quality conference bringing together a wealth of quality professionals from all over the world to exchange ideas and interact with other leaders within a variety of industries. The theme this year was “The Innovation of You.” Sessions focused on topics ranging from Quality Fundamentals, Risk and Change, Building and Sustaining a Culture of Quality, to Future of Quality. I had the opportunity to experience great knowledge first hand from quality experts and also to meet and network with other quality professionals from across the globe. Initially, my primary goal was to improve my own knowledge base. I wanted to increase my proficiency in communicating on a technical level with potential clients. In the end, I came away with a lot more. I realized that for quality professionals, quality begins at home. Continuous education is vital for all staff to ensure each and every one of us is able to play our role in strengthening and maintaining a culture of quality within the company. We don’t just sell quality services, Pro QC aims to exude quality and show clients that we practice what we preach. Secondly, and perhaps most striking, was the feeling that quality is a thriving organism, changing, growing and developing. The significance of this for us as a company is in understanding the potential we have as we navigate the blue oceans opening up in the sea of disruptive technologies and disrupted markets. In this blog post “Reflecting on the Advantages of Technology on QC.” we reflected on just how much our operational environment has changed over the years. Pro QC is not just a company which endeavours to provide inspection services or quality audits. Pro QC strives to stand out as a provider of solutions drawing on our extensive experience in quality, going above and beyond the traditional roles of quality engineers to fulfil the role of problem solver and adviser to our clients. Overall, the ASQ World Conference of Quality and Improvement was educational and professionally inspiring. In addition to my participation as an attendee of the conference, our U.S. team was exhibiting. This year marks the 7th consecutive year Pro QC has exhibited at the event. Involvement in events such as this one is both indicative of our professionalism and the direction of the company within the future of quality.